001. This week I'm planning on working my socks off for uni. I'm too far behind to keep trying to not bother with my workload. I'm about two projects behind in one module and then a further 4-5 in my other one. Might post up some of my work if its any good, which it usually isnt so dont get your hopes up! 002. Come Monday I'm back on my diet, Ive had a grand total of THREE KFC's this week. Which is ridiculous! I'm such a sucker for fast food. Since I stopped restricting my food intake I've only really put on 3-4lbs, 5lbs max. But I need to lose weight for my holiday in June because for the first time ever I really really REALLY want to wear a bikini on the beach! 003. I was contacted by the ever so lovely Ella Masters to be part of her new zine, Which is totally exciting to actually collab and work with someone. I'm planning on doing a new type series as my submission to the zine! Which I'm super excited about because it's been far too long since I've drawn much. I do still draw alot just none of it feel like its good enough to show you guys and upload to Flickr. 004. Last night I somehow managed to spend nearly £300 on clothes. This week moneys been burning a hole in my pocket, Ive spent at least £80 on petrol (I swear my cars broken cause I haven't driven THAT much), I spent £5 on 40 pairs of fake lashes from eBay? Do I need 40 pairs of lashes? NUHUH! However upon looking at my online bank account today I got my student loan, which inevitably means more spending. BOOHOO (not). Plus i spent £50 in Primark today with my Mama, I did get a good load of stuff though, Cannot wait to show you! 005. Ebay has become my latest addiction, I managed to purchase some really lovely and cheap stuff recently. I bought this adorable spotted oversized tshirt dress, a beautiful deep blue silk tunic, a heart print skirt and this amazing retro tunic. I love getting all these packages through my door, especially when they look nicer in real life than in the images. It makes me happy! 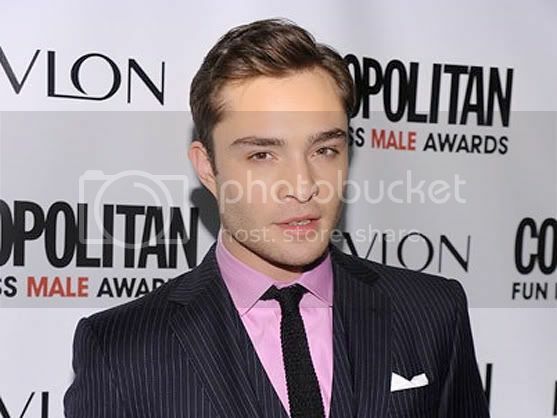 Ed Westwick's real voice (lahhhhhndahhhhnnnnnnn) makes me swoon, he's so hot. Check your tyres don't need inflating, I always find I use loads more petrol when mine are low! The 40 pairs of fake lashes thing made me laugh!! wish i could afford to blow £300 on clothes lol, your new buys sound lovely cant wait to see pics.